It’s Wednesday, so you know what that means! I’m reviewing four new issue #1s that came out today. 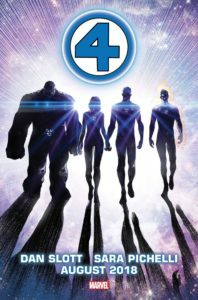 I usually try to keep the publishers to smaller presses, but today with Fantastic Four back after five years, I had review it for one of the four, but spoiler alert, it’s not my “Best of the Four” this week. Hey! It’s another hero book that feels like all the other hero books. I hate to say it, but this relaunch is just OK. The art of Sara Pichelli is AMAZING, but the story is just what you’d expect. This is way I do not read many hero books these days; there is nothing new under the sun. We get some back story. We get some sob story. We get some funny. We get a tune in next week. I have nothing else here. If you are looking for the Fantastic Four to be back in a BIG WAY, you’ll be disappointed. But you will at least get to see The Thing, Ben Grimm, cuddle a kitten or two. This is my second SBI Press book in three weeks. 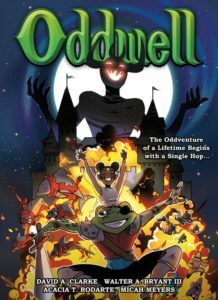 The first was Hellicious, what I thought to be a bit I Hate Fairyland-y, and this week it’s Oddwell, which I feel to be a bit a bunch of other stories-y. While the battle frog attracted me, this comic fails to bring anything new to the table. Where do I start? The characters seems haphazardly tossed together with no rhyme or reason. The action, at times, concludes without ever showing how the action concludes? At one point, our hero is battling three baddies, and he twirls his sword, and they are just gone. Yep, gone. And he moves on. The art isn’t bad; it feels like a YA Dark Horse book. It’s sort of funny in its writing. The story is just nothing that is going to keep me reading. You might not agree with me, but I do not see how these characters (many of which will feel very familiar to you) blend. I picked this up as one of the four based on a flip through. The art caught my eye, and I’m sorry to say that my praise of the book ends there. This is an issue about a tough dinosaur…I guess. We only meet him at the end of the issue because most of the issue follows two kids as they attempt to get a picture of an allusive dinosaur so the local paper will pay them $50.00. The pacing is off. I guess in concept, the issue could work, but the way in which the plot progresses feels strange and amateurish. I have never heard of Golden Apple Books. Maybe this small press will be (or is) a training grounds for future stars. Like I said, the art in this book did hook me; it is fun and very colorful: I dig that. 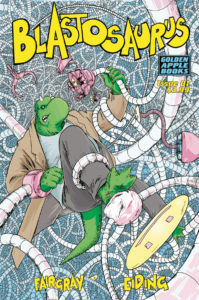 After a visit to goldenapplecomics.com, it looks to be a store in L.A.; a store publishing comics? Possibly…but Brian K. Vaughan will be there on August 17th, so that’s cool! Black Badge comes in as the Best of the Four this week. It’s the second “best of” from BOOM! Studios in three weeks, and this decision was an easy one. 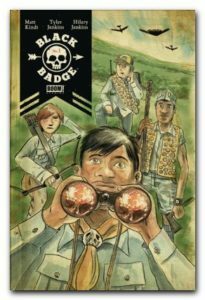 Glancing at the cover of Black Badge you’d think it was Lumberjanes, with boys, done by Jeff Lemire; you would, like me, be wrong. This book is the Boy Scouts meets James Bond. I will not spoil anything here because I enjoyed the pacing of the issue, and I want it all to unfold to you as it did to me, but I will tell you to not be fooled by the simple art. This book is complex and seems to be going to some dark places. I like the matte-finish paper as well; it adds an aesthetic that lets the reader feel the physical and metaphorical roughness of the issue. Added to the pull list!